(Author’s Note)… I guess I don’t have much to say. If you aren’t reading this, you aren’t reading it. “There, there, and there,” said the Warlord, flicking a tentacle tip at three dots on the scanner screen. “Those are the commanders, at the base of the three large, inverted-V formations. 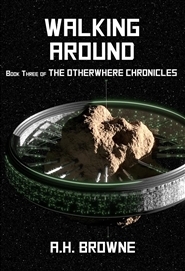 That makes that one,” the tentacle tip flicked to another dot, “the fleet commander.” The three V’s were in a line, side by side, open mouths aimed at Earth. The single dot indicated by the Warlord was the one at the rear of the center V.
Gup and the General were flying one of the tiny insectoid surveillance bugs around the cabin using a small thumb operated joy stick on a small hand-held remote pad. Gup had the pad in one hand. The drone silently buzzed over and hovered a foot or two in front of Arthur’s face. Arthur looked past the tiny thing and saw his own face on the monitor screen on a small control panel the General was fiddling with. He tried to refocus on the flying speck and it took him a few seconds to find it even though he knew it was there. He grinned fiercely. The bugs were practically invisible. “That’s good flying, Gup,” said Arthur to the blue tech wizard. “Now let’s see if I can figure out how to get it where it needs to go.” He had tried to get some help figuring out the procedure for long-range precision transport beaming by slipping his hand into the sports bag that nestled under the pilot’s seat. But once again the memory stone and the Pickles had been unable or unwilling to help directly. So, it would have to be trial and error. It played out like some kind of reality game show where contestants had to perform a whacky stunt for cash and prizes. Just beam a tiny bug from a fast-moving ship in space right onto the bridge of another ship moving at equal speed. They lost a few bugs before they figured out how to slave the remote-control unit to the ships scanner array. Another bug twinkled and disappeared, and there it was, flashing a pulsing view of the bridge of the enemy ship onto the monitor. But was it the right enemy ship? Gup moved the drone to a high corner in the back of the bridge and spun it around. On the monitor, the bridge panned past in a wide fish-eye view. And there he was, sitting in the captain’s chair set on a raised dais like Captain James T. Kirk commanding the Enterprise. Even though he could only see the back of his head and his shoulders, Arthur could tell it was him. He gave Gup and the General a ferocious grin. “Should I move the bug closer just to make sure?” Gup asked. “No, I think I ought to be able to recognize myself, even from the back. His hair is still long. What a loser. I gave that up in my mid-forties. Show us how many crewmen on the bridge, buddy,” Arthur ordered politely. Gup wiggled his thumb and the view panned as the bug rotated in the air. “I make out twelve targets, all human,” said the General at his little console. “There must be armed troops aboard, at least a security detail that could reach the bridge in case of trouble,” Arthur guessed. “But we can’t just pop straight over to their bridge, because we will be helpless before we finish materializing. That is why I brought those guys.” He pointed at the five war robots standing like silent sentinels. He turned and walked to stand before the closest of the battle machines. “I am Arthur Blacke,” he said to it, as Tarlek Da’s instructions had told him to do. The robots red eyes gleamed. “I am designating you as ‘Number One’. Number One, respond.” Arthur felt a little silly and sort of cool at the same time, talking to a robot that was armed to the teeth, to use a not-quite appropriate expression. “Number One is operational,” said the robot. Arthur couldn’t help laughing. Tarlek Da had used Izalie’s voice in the robot’s synthesized speech unit. To hear the deadly looking machine speaking in a sweet little girl’s voice just struck him as hilarious. He activated two more of the robots, designating them ‘Number Two’ and ‘Number Three’. The mechanical killers eyed him calmly with their disquietingly feral optical sensors, awaiting his commands. “Yes, Sir,” replied the robot sweetly. “Yes, Sir,” came the reply. “Yes, Sir,” the robot answered once again. “Yes, Sir,” the robot responded. “Is everybody ready?” Arthur asked his brave crew. Everyone replied in the affirmative. Rubar’s boys were so ready they could only snarl in anticipation. “That no-killing order goes for you, too, unless it is absolutely unavoidable,” Arthur told them severely. He received sheepish grins and nods in return. “Okay, let’s do this,” he said, and punched the button on the transport remote. The robot designated as Number One began to shimmer and wink in and out of visibility. “I didn’t want to send him into the deck,” Arthur explained. “Better safe than sorry.” He went over to join the General at the control panel for the surveillance drone. “They spotted Number One,” the General pointed out. On the monitor they could see crewmen pointing and turning to look at their unexpected visitor. “Turn up the sound on the bug, Gup,” Arthur requested. So far, the humans on the other ship seemed too surprised to react. Now they could hear the excited babbling of the enemy crewmen coming through the speaker in the console. “They say the camera adds ten pounds,” said Gup with a grin. Arthur shot him a nasty look. In the foreground of the screen the robot finished its strange journey. Then it fell about a foot to the deck, effortlessly absorbing the shock with its flexible track pods. “Cease all movement. Do not utilize any equipment,” Number One commanded, the orders made incongruous by the little girl voice. “Rubar, time to go,” Arthur shouted. He made sure that he and the three Reavers were all touching each other and pushed the remote button once more. Rubar and two Reavers, holding needle guns at the ready, began to exist in two places at one time. On the monitor Arthur and the General watched the human who had turned back to his station. He was clearly whispering into a microphone but they could not hear what he was saying. 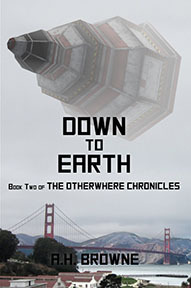 There was a popping sound and a black object streaked from the robot to connect solidly with the side of the human’s head. He slumped in his chair without a sound other than the loud thump of the rubber bullet as it impacted his skull. Another human didn’t stand quite still enough to suit the robot. It launched a small packet that split open in midair, spreading into a three-foot-across circular web of glittering microfilament metallic netting. It wrapped around the human’s torso and emitted blue sparks. This human also dropped, to twitch spasmodically on the deck. Rubar and his two compatriots finished flickering and also dropped a foot or two to the deck of the bridge. No one else on the enemy bridge was stupid enough to try moving. “Now it’s my turn,” said Arthur, grinning from ear to ear. “If you think they were surprised before, wait till they see me.” And with that, he transported himself and two more of Rubar’s boys to the other ship. This entry was posted in fiction and tagged aliens, books, fiction, humor, novels, science fiction, writing. Bookmark the permalink.